The MRL "business plan" was simple. Elmer placed vaguely worded three line advertisements in various magazines, such as the one above from a 1938 copy of "Popular Mechanics." If you were interested, you sent your 25¢ to "Laboratories." You would then get HB-25 and a copy of "Radio Builder and Hobbyist" in the mail, along with a catalog. 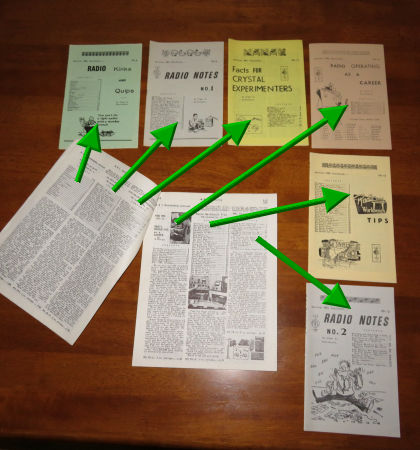 Three more "Radio Builder" booklets would follow during the year. An MRL No. 2 single dial set. Here is where Elmer's knack for business comes in. 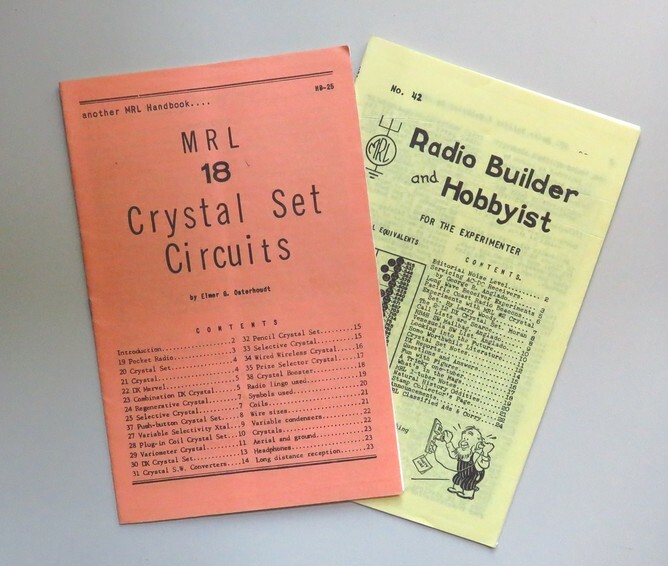 All of the crystal sets in the handbooks and "Radio Builder" used MRL parts! Though Elmer gave detailed instructions on how to make the various coils and gadgets, he also sold them. If you wanted to wind the coils yourself, MRL sold the coil forms and wire. 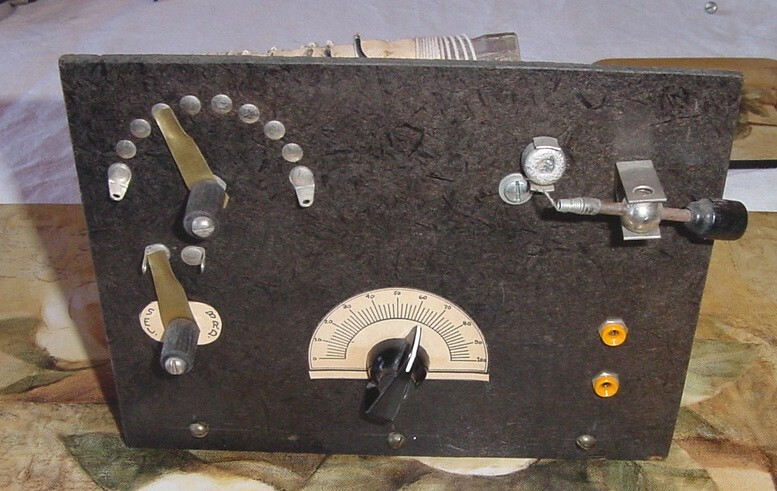 MRL sold every part needed to make the radio above, and then sold the kit so you didn't have to order each part separately. If you only ordered a crystal and a pair of headphones and decided to make everything else yourself, Elmer threw in a brief handwritten note and a random "Detail Print" with the order to keep your interest piqued. Then three months later the next issue of "Radio Builder and Hobbyist" would arrive in the mail, just in case life got in the way and you forgot you were supposed to be building a radio. 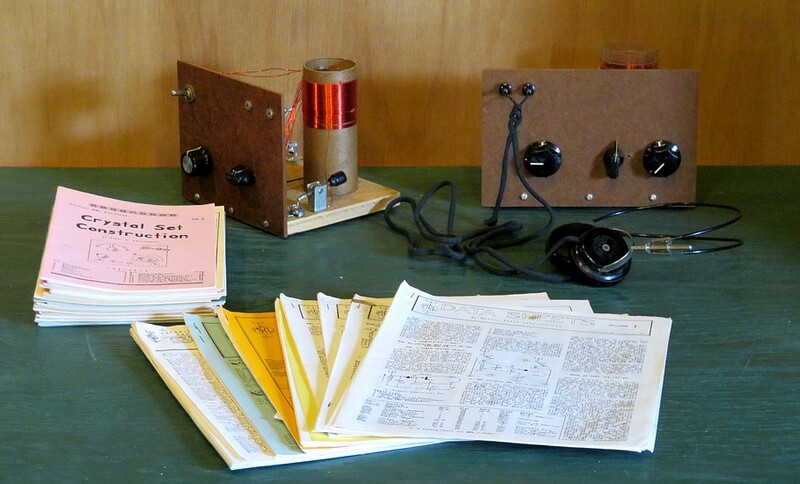 If you already built one, "Radio Builder" would whet your appetite to build another one! The first page of the catalog covered postal rates, followed by a small "Let's get acquainted" introduction to MRL. The next page described the first three handbooks. The following pages described more handbooks, after that came the Detail Prints and other publications. This went on for eleven pages!! 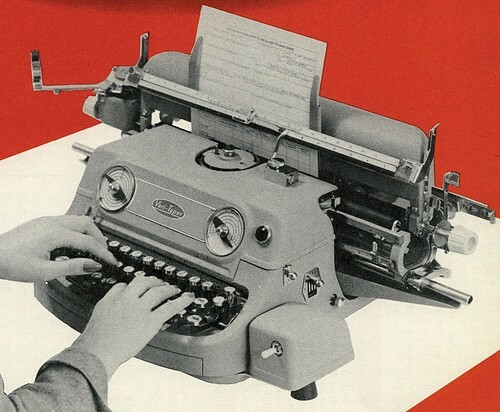 After Elmer wrote a Handbook, Mabel Osterhoudt typed it on a Varitype machine. Elmer would then print them with a lithographic printer. According to the text in the picture, this is just what they needed for all those catalogs and handbooks. In the 1930s Elmer referred to the publications as "blueprints" because they were mimeographed! All of the publications are black and white (or blue and white). The cover sheet was usually a colored piece of paper. Mabel also sent out orders, typed and assembled the pages of the Handbooks, turned boxes of parts into kits and kept the company on schedule. Elmer did the bookkeeping, manufactured parts, bought supplies and created the literature. 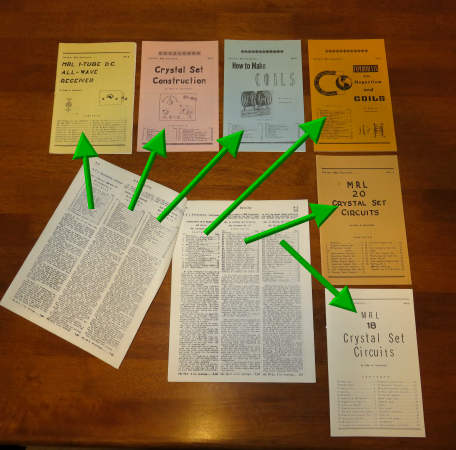 With the exception of HB-3, "CRYSTAL DETECTORS," almost all the surviving handbooks have a copyright date from the 1940s and 1950s. There is a clue as to why in HB-3. It states, "Copyrighted 1938. Re-written and copyrighted 1954." 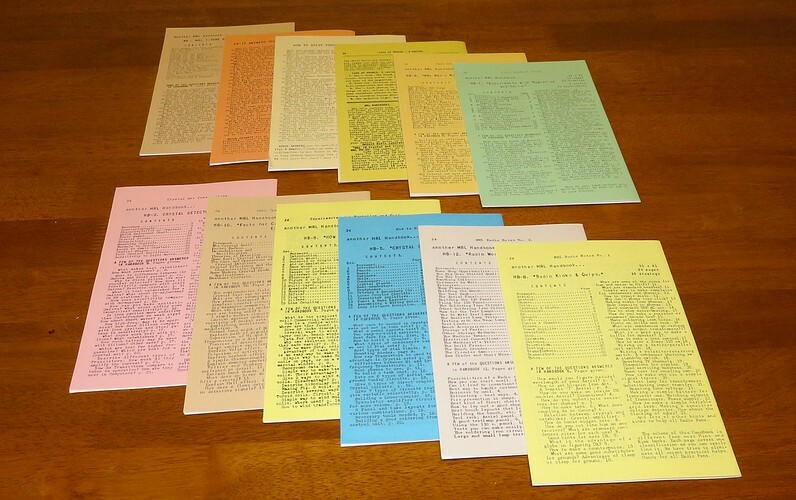 Some of the handbooks say they are combinations of previous publications or that the mimeograph or lithograph plates wore out, so a new handbook was written. 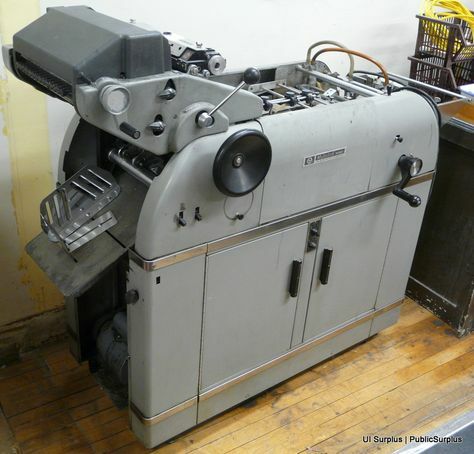 A lithograph printer. This is a "Multilith" model 1250. Elmer mentioned this model in one of his Handbooks. As time went by you'd end up with everything Elmer printed, as in this staged photo. This MRL literature and the radios are from the 1980s. More marketing. On the backs of these ten handbooks are descriptions of other handbooks! From what Elmer related, all of this was typed by Mabel, but it must have been a team effort. Here's an example. This is the back cover of "Facts For Crystal Experimenters." It describes HB-9, "MRL Radio Notes No. 1." 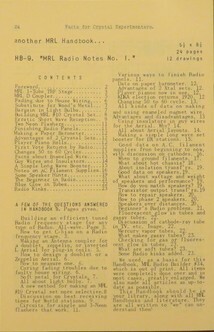 It states that the basis of the book was Radio Builder #34, which is out of print. Looking at the rest of the index there is something that you'd want to read about. And it was only a buck. You didn't know it, but that 25¢ handbook, which was now a dollar, was half price due to inflation. It should have been two dollars. Elmer advertised MRL in MRL publications for MRL customers. Click on it and see what I'm sayin'. The handbooks, Detail Prints and Data Sheets were chock full of crystal set circuits, many of which required multiple MRL coils. In "18 Crystal Set Circuits" there is an all-wave circuit requiring a complete set of MRL plug-in coils. Another uses a MRL variometer. Several use the MRL QRM coil ahead of the main circuit. In HB-13, "RADIO NOTES NO. 2," on page 18 there is mention of an "old Experimenter" who went into business for himself after wearing out many MRL Handbooks. For more details you need to get HB-11, "RADIO OPERATING AS A CAREER." If you were interested you sent for HB-11 and since you were sending for HB-11, you might as well send for a few others and some coils and crystals and switches, etc. When your order arrived you'd get a note from Elmer which made you feel like he knew you. If you placed an order, an MRL RADIO FLYER would sometimes appear in your mailbox. (The top of the cover sheet is shown here.) If that wasn't enough, Elmer didn't like the Post Office to make any extra money, so if your order weighed 1.5 pounds and the postage was 2 pounds, he'd stuff a half pound of literature in the box. No need to look for an envelope. MRL sent envelopes and order forms to you with the catalog. On the envelope was a drawing of the MRL 1-Tube radio and the MRL No. 2 Crystal Set. Around 2003 Paul Nelson restored Elmer's Lithograph printer and printed the entire remaining catalog of MRL documents on high quality, acid-free paper. The set sold for $34, which was quite a bargain. An interesting observation about the handbooks are their size. A "standard, letter size" piece of printer paper is 8½ x 11 inches in dimension. 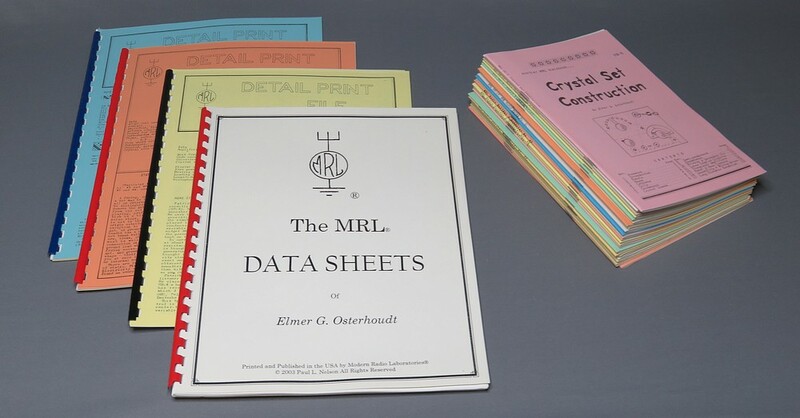 The MRL handbooks, when opened, are 8¼ by 10½ inches. To make a copies of the handbooks, Paul Nelson had to cut every piece of paper to 8¼ by 10½. Why are the handbooks this size? Another MRL mystery. To add to the enigma, they are advertised as being 5½ x 8½. This is the size of standard printer paper when folded in half! Were they printed on standard size paper at one time? Did Elmer chance upon a large supply of off-size paper that nobody wanted, and the price was right? We may never know. 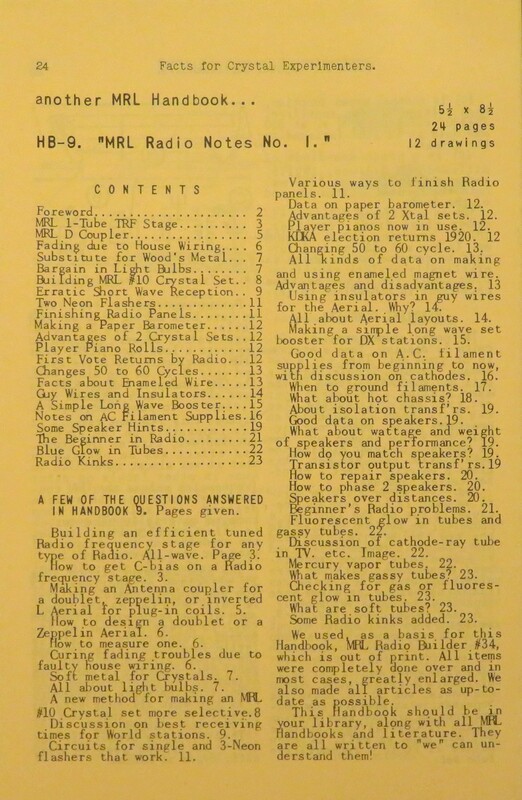 MRL "Radio Builder & Hobbyist"
in 1932. All are out of print except the last five on this list. RBH-1 to 40, 44, 45, 46 & 47 - out of print. RBH-49 Last issue, dated "Summer 1959." MRL "Experimenter’s Electronics and Science"
Note: There were earlier documents named "BP" or "Blue Print" because they were mimeographed. For example, HB-25 replaced BP-25. The plates for the BP series wore out or in some cases disintegrated. 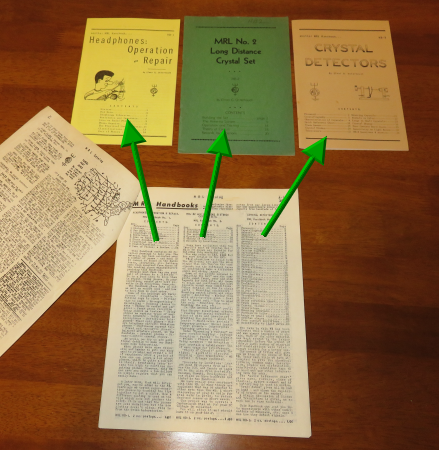 In addition to the annual MRL catalog, the "Radio Flyer" was published, which included revisions to the catalog and "Random notes from Modern Radio Labs." There were at least 23 of these. On Page 13 of "Radio Builder & Hobbyist" No. 49 (Summer 1959) is a column titled "Les Hulet Reports." From 1944 to 1955 Leslie Hulet posted more ads in Popular Science and Popular Mechanics than Elmer Osterhoudt did. They are all the same as above. Directly across from the column in RB&H No. 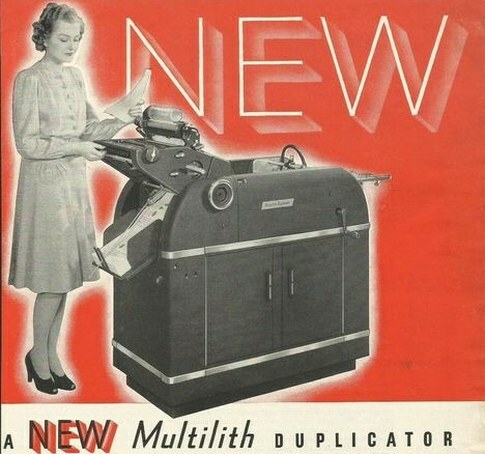 49 is the exact same advertisement by Hulet as in Popular Mechanics! Here's Hulet's ad from the back of RB&H No. 41, printed by MRL in 1955. I wonder what you got if you wrote to him. Whatever it was, he was probably running a crystal radio set business. Here's another Varityper machine, but more sophisticated. 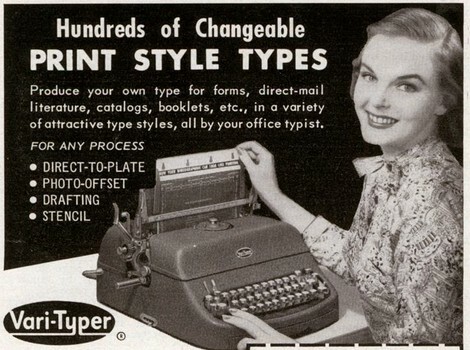 A Varityper could type both left and right justified print. It was a marvel of engineering but this one looks like a "creature from beyond space," eating a woman's fingers.